Sports day was a good turn out and we all had such a great morning. Thank you parents for your support and the children for participating on the day. Please see Facebook for some photographs of the event. The rest of the photos are found here. A special thanks to: www.sa-argus.co.za Laser machines for sponsoring our medals! www.janineaxmann.co.za for our beautiful photos! Winter is not the most pleasant time of the year with its cold weather and especially the flu fairy traveling around. This has always been the time of year that many adults and children get sick, so as a precaution to keep our school flu free we ask that any children showing signs of illness to be kept at home to avoid spreading to other children. This is also for the comfort of the sick child as they are miserable, achy and all they want is their mommy. It is school policy that if a child is sick or on antibiotics they must remain at home until they are well again. However we are also doing our part to keep the school germ free and clean as possible. Thank you to those parents who do keep their sick children at home, it is really appreciated. The parents will be given an opportunity to meet with the class teacher to discuss their child’s progress. Teacher Samantha’s meeting will be on Monday 11 June. 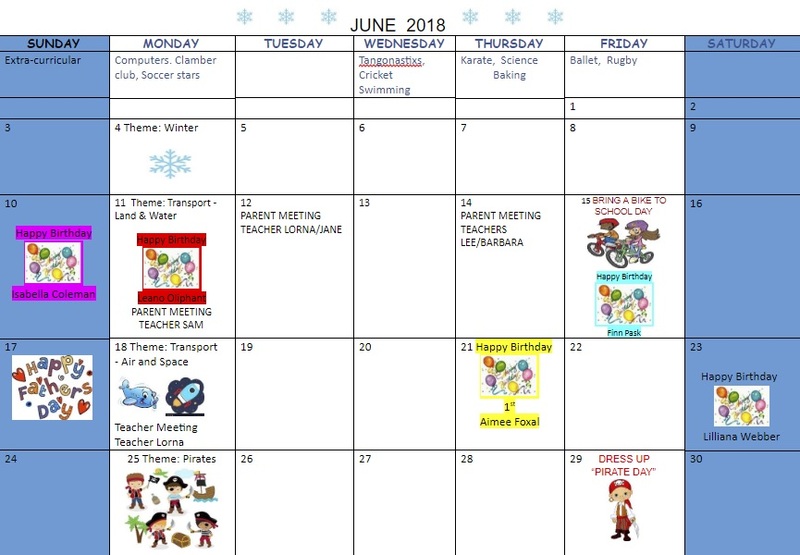 Teacher Leyha’s meeting on Wednesday 13 June, Teacher Barbara’s meeting will be on Thursday 14 June and teacher Lorna/Jane meeting on Monday 18 June. A meeting time sheet will be placed outside your child’s classroom. Please book a time to see the teacher. The allocated time per parent is 15min. If you feel this is not enough time to discuss your child’s progress or if you cannot make this date, please discuss this with the class teacher so she can reschedule a time that suits both parties. Please note the teachers are not at liberty to discuss any child’s progress or development other than their own child. The school ran this project a few years ago and we thought it would be fun to introduce “I am Special” project again. Each child per class will be given an opportunity to be the special child for a particular week. The aim is to build confidence and self-worth within the child. What we ask of the parents is to be creative in any way they can by either making a family poster or writing a letter to their child explaining why they are so special. The class teacher will display the poster, read the letter to the class and make that particular child feel very special. We also ask the parents to bring a treat for the class on the Friday. We would like to encourage parents to avoid bringing sweet treats or if you do please make them in very small bite size portions, alternatively parents may bring in games or simple toys for the children to share, we often find the simplest item brings out the most joy in a child. If any parent needs help or advice please do not hesitate to ask. The teacher will give out a list of names, dates when it is your child’s turn, or you can ask your class teacher for a time when is most convenient for your schedule, in order to prepare in advance. Bring-a-bike-to-school Fun Day will be this Friday (15 June). All the children are welcome to bring their bikes, tricycle, bicycle, scooter etc. to school. The parking lot will be made available for the children to ride freely and have fun. Please dress your child as a “Pirate” so we can go on a Private Adventure at school on the Friday 29 June. EMPTY TINS for a craft project. We would like to do a special craft with the children so we are requesting that if you have empty tins e.g. Bake bean, jam tins etc. Please can we have them preferably one tin per child. Thanking you in advance. We would like to wish all our dad’s a wonderful Father’s Day on the 17 June! I hope your family spoils you on that day.